It's like Honey Bunches of Oats got an extreme makeover! I love the original varieties of H.B.of.O., which usually have a corn flake as the base. These flakes were transformed into super-crunchy multi-grain flakes that not only pack in a warmer flavor, but much more fiber and healthy goodness! The bunches were also super crunchy and worked together well with the flakes to maintain a nice consistency in the cereal. In fact, they gave me a distinct flashback to Craklin Oat Bran cereal, as if those little O-shaped pieces in the aforementioned cereal were crumbled up and made into oat clusters. Needless to say, it is delicious. If you loved Cracklin Oat Bran and any of the original varieties of Honey Bunches of Oats- you'll LOVE this cereal. Stayed crunchy all the way to the bottom of the bowl. My only complaint is that I did not get a distinct vanilla flavor from the clusters, but on the good side - there wasn't any artificially flavor aftertaste that often follows such flavors. I recommend buying this cereal asap! You can even try it free at onespoonful.com Just remember to say that you heard about it at MrBreakfast.com! What do you think of Honey Bunches Of Oats w/ Vanilla Clusters? It's a good cereal. 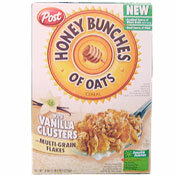 My favorite is the Original Honey Bunches of Oats, but the vanilla flavor adds a bit more to the whole experience. They're great. This cereal will give you gas... LOL But it is good. Where do you put the code that is on the box. It tells me to go to onespoonful.com then it pops up stuff. I really like it, but can't find it lately. The vanilla flavor is really good. No vanilla taste at all in this cereal. Poor choice for a "honey bunches of oats" fan! Very bland. Wish person who threw his away would have given it to me. j.f. Love H.B.O. have it even as a snach .J.F. This cereal is very tasty and healthy nourishing Breakfast. We all love to have it. The cereal is really good. This cereal is so nasty. It contains more vegetable oil than high fructose corn syrup and has over 200 calories in one serving. It did not taste like vanilla at all, but I could sure taste the vegetable oil! I took two bites and threw the rest away. 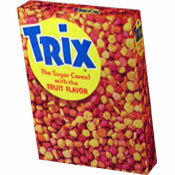 I love this cereal. It fills me up and keeps me going until lunch. I can enjoy this cereal all day long. Kellie from Hollywood, CA nailed it with the review she emailed me (above). Thanks Kellie! You are a great chick! Great texture and great taste. I'm talking about the cereal now and not Kellie... although those descriptions may very well apply to her. The vanilla in this cereal is so subtle, that it's a stretch to use the word in the name. "Honey Crunch Clusters With A Soft Kiss Of Vanilla" would be more descriptive. All in all, this is a great cereal. Give it a try. I bet you'll like it.